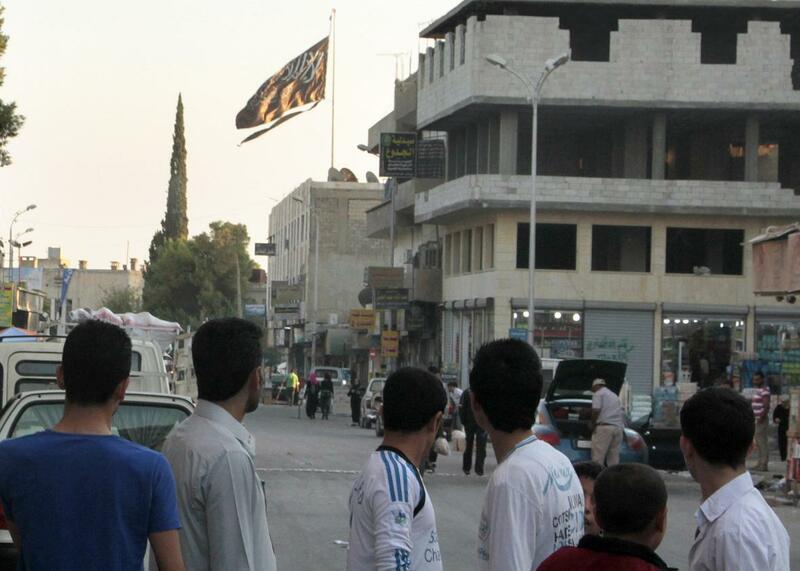 A group of men look at a large black Jihadist flag with Islamic writing on it proclaiming in Arabic that ‘There is no God but God and Mohammed is the prophet of God,’ in the northern Syrian city of Raqqa, on Sept. 28, 2013. 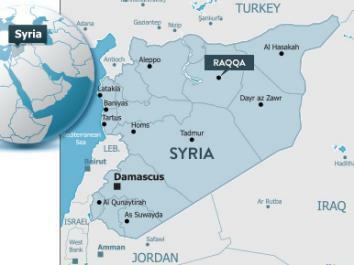 French jets bombed several ISIS targets in Raqqa, Syria, on Sunday in retaliation for the attacks in Paris Friday night that left at least 129 people dead and hundreds more injured, several sources report. The French Defense Ministry said that France dropped 20 bombs on the city from 10 to 12 planes launched from Jordan and the United Arab Emirates, Reuters and ABC News report. The airstrikes hit a jihadist recruiting center, a terrorist training camp, and a weapons warehouse, and were carried out in coordination with U.S. military command, ABC and the Washington Post add. According to both the Post and ABC, “activists” on the ground in the Syrian city confirmed the strikes on Twitter, saying water and electricity were cut off after the bombs were dropped. CNN cites French Defense Ministry press adviser Mickael Soria as saying that all of the bombing campaign’s targets were destroyed, but Reuters cautions that there is no word yet on the number of casualties or total damage. Raqqa, a city of about 200,000 in northern Syria, is ISIS’s self-proclaimed capital, according to the New York Times. American and European officials have said that the assailants in Paris communicated with known ISIS members in Syria before the attack, the Times adds, but there isn’t yet definitive evidence of links between ISIS in Syria and the Paris attackers, despite the group’s claim of responsibility. The attacks come amid a manhunt for at-large suspects connected to Friday night’s massacre, and a day after the U.S., Russia, and other world powers announced a joint plan to pursue peace and elections in Syria, although Syrian representatives have not yet agreed to take part in that plan. The Post also reported that President Obama, speaking from the G-20 summit in Turkey, said Sunday that the Paris attacks would not lead to an altered American strategy against ISIS.